Self-contained wall mount electric two-level water cooler. Model EZ(S)TL8 shall deliver 8 GPH of 50°F drinking water at 90°F ambient and 80°F inlet water. Unit shall meet ADA guidelines. Unit shall be lead-free design which is certified to NSF/ANSI 61 and 372 and meets Federal and State low-lead requirements. Unit shall be certified to UL399 and CAN/CSA 22.2 No. 120. Models EZSTL have self-closing Easy-Touch pushbar controls on front & sides. NOTE: Minimum 40 psi supply line pressure required in special circumstances where both sides of two-level are in use simultaneously to ensure adequate stream height. 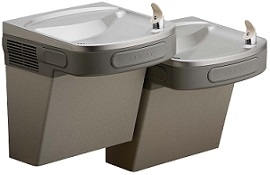 STANDARD FEATURES Easy-Touch pushbar activation Extra deep basin minimizes splashing; with integral drain Valve with built-in flow regulator to provide constant stream from 20 to 105 psi water pressure Versatile cooler design allows units to be installed either left-hand high and right-hand low or left-low and right high Cooler panel finishes: Light Gray Granite Vinyl Clad Steel or Stainless Steel Rated for Indoor Use Warranty: 5 year limited warranty on the unit’s refrigeration system. Electrical components and water system are warranted for 12 months from date of installation or 18 months from factory shipment, whichever date falls first.